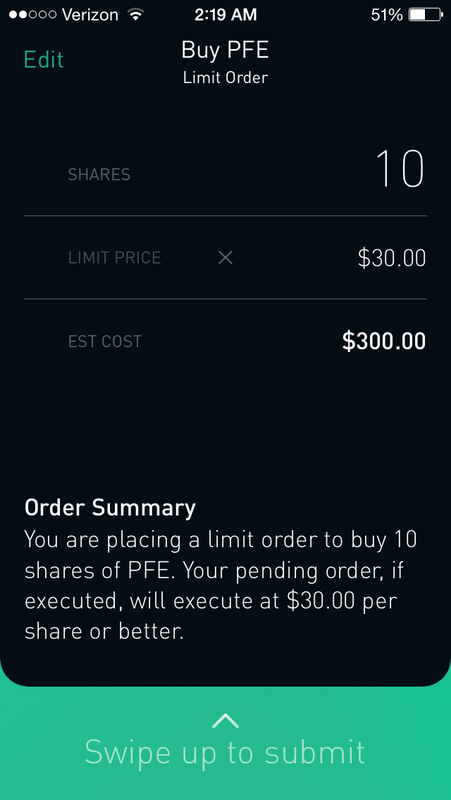 I was invited yesterday to use the (seemingly) exclusive trading platform called Robinhood, that just raised ~$15 million in venture capital funding. They had roughly 500k signups for the initial “beta” or first adopter program, and it looks like they started sending out invitations just a few days ago. If you haven’t heard of Robinhood before, they have been making news in the stock trading circuits for being advertised as a zero-trade commission stock brokerage. Something I had never heard of until now. So let’s first take a look at their App, which, for the time being, seems to be the only way to make a trade. 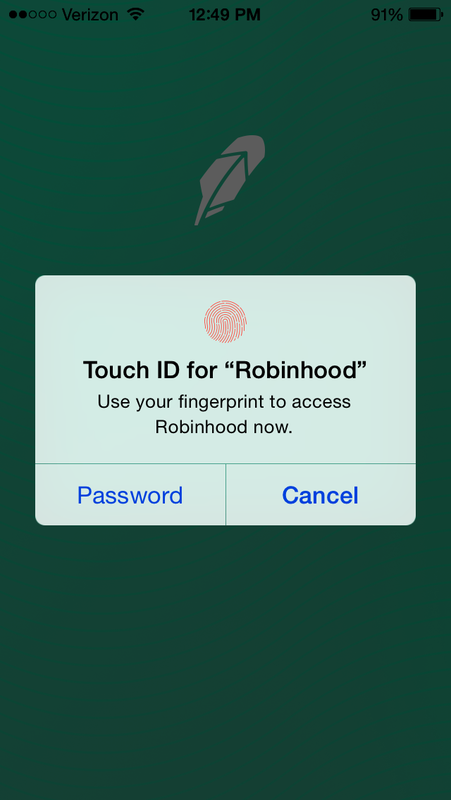 A cool feature that I immediately noticed is that once you initially signup and make an account, you can use your fingerprint for all future signups (sorry, iPhone 5 and earlier users!). The app is not yet available for Android, although they have announced that this will be a feature added later. Right off the bat, the app is really beautiful. I’m a sucker for mint/off green colors so that itself is nice from a UI perspective. As far as content, well, it’s lacking in a few places. I found out after playing around with the app that holding your finger across the chart will show chart information based on the day/time. While a nice touch, I would have had no idea that this was an actual feature unless I accidentally rested my finger on it. It does have all the basics, like 52 week high/low, and dividend yields. What it doesn’t have (that I really love when using Etrade) is a part where it talks about news and company updates. There is lots of room to expand here while still keeping the uncluttered design style. Funds take 2 business days to transfer to your account. I transferred $500 (there are no minimums for your account balance, did I mention that?). In my account right now it lists as transfer pending, so I should expect to have these funds in my account by tomorrow afternoon. In order to perform a trade, you need to navigate to the search bar and type in the stock symbol or name of the stock you wish to buy, but it won’t show me that option until the funds are in my account. Just as expected, the funds were deposited within two business days. Happily I took the pre-trading survey, which consists of a few questions asking your income and trading experience (the survey is optional, but it took it because, why not?). 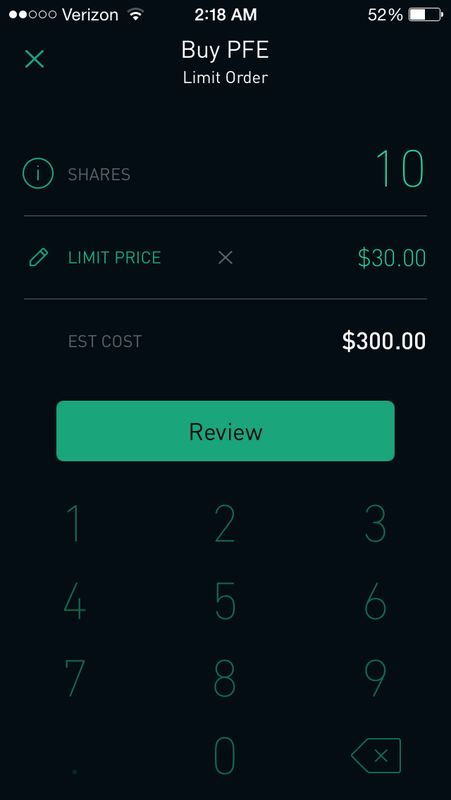 Making a trade was simple enough, type in the stock you want, press “Buy” and it will take you to the order screen where you can select either “Market” or “Limit” stock options. I chose Pfizer as my test stock, since it was late at night I knew there was little chance of the trade going through in after-hours, and tried to make a trade. 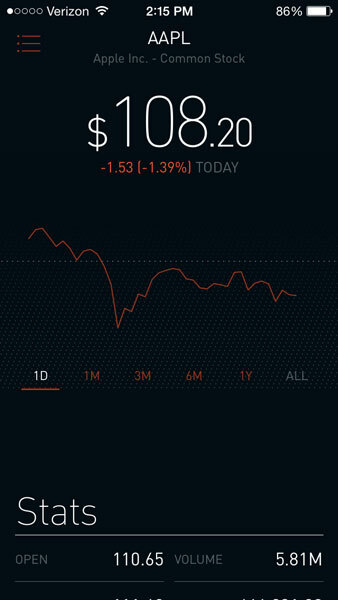 Robinhood, as it stands right now, lacks some of the heavy analytical features that I’m familiar with using the Etrade platform. I don’t know if they plan to expand this in the future, but I think I will use Etrade for research and Robinhood for actually making the trade. The app works flawlessly, I didn’t encounter a single bug while using it (so far) and was easily able to place a trade. 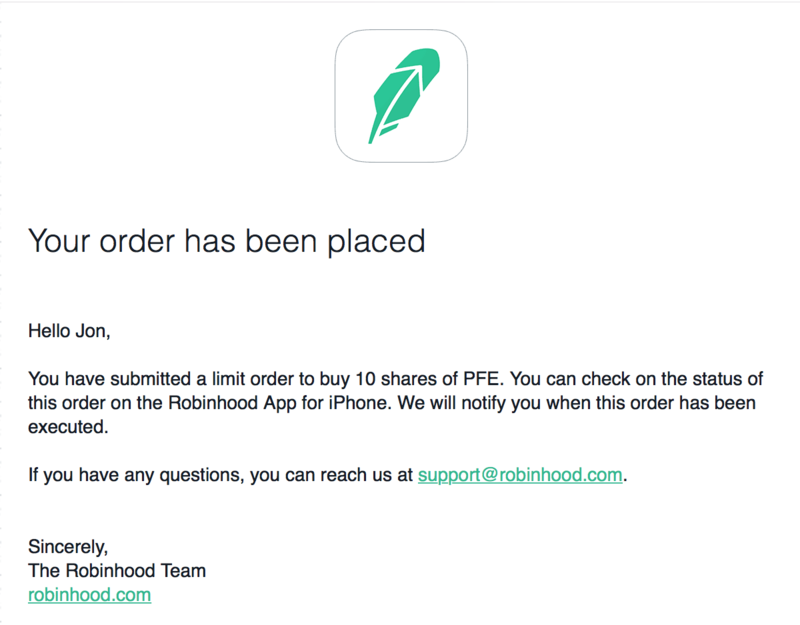 One major downside is that there seems to be no phone support, but there was a link to their email support which seems to be the only way of contacting the folks over at Robinhood for the time being. I’ll update this later as I find a stock I like an make an actual trade, but for the time being, Robinhood is sure to be the choice for those unwilling to pay commission fees for each trade. Here are a few codes they gave me that you can use if you want to skip the waiting list and tryout Robinhood for yourself. Signup codes are no longer valid, and there is also no wining list to try the app anymore. You can download the app directly from the app store.